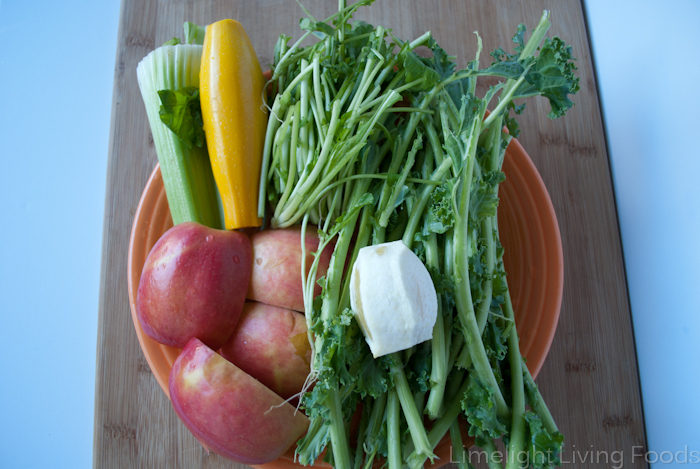 CW Arugula roots, kale stems, peeled lemon, pink lady apple, celery, and yellow summer squash. Do you ever wonder what to do with all your kale or other leafy stems? I usually do too, right as I’m throwing them away. 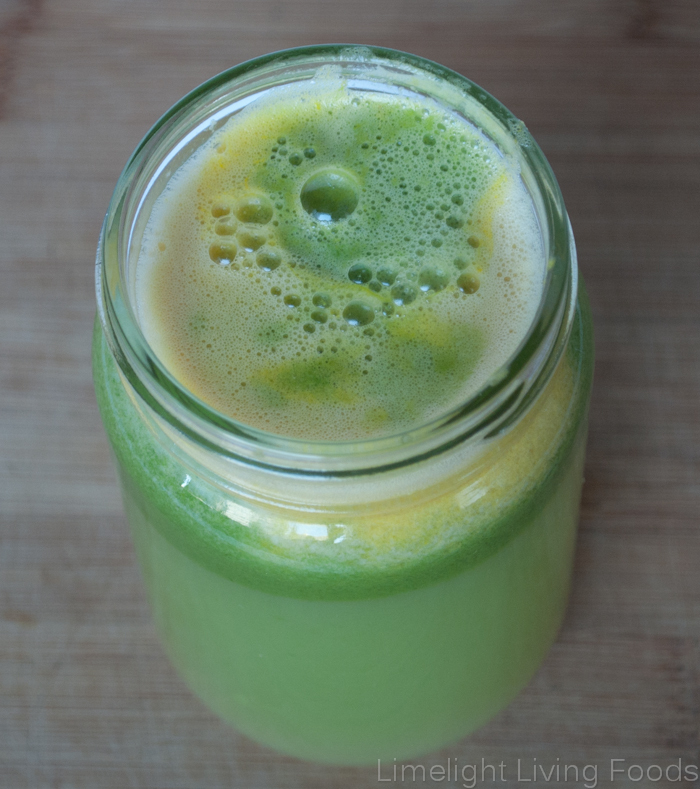 This time I decided to do something different after making kale chips by making this juice, a way to use up your stems indeed! The juicer that calls our place home is the trusty Jack LaLane juicer. It is a centrifugal juicer. A grating blade surrounded by a mesh basket spins around very quickly. As you load fruits and veggies in, the grater spins around extracting the pulp depositing it into the container in the back while the juice pours out the front. Its a great juicer but definitely not ideal for leafy greens like spinach and wheat grass. I’ve had it for 3 years and its still going strong. Although, I did almost kill it with pomegranate seeds – twice (I don’t recommend). I still think its a perfect juicer for beginners due to its low price, ease of use and quick to clean. We had bought a lot of arugula or rocket as its known in Europe, along with Kale at our local farmer’s markets. Kale is one of our favorite green staples. We use it to make dehydrated kale chips, smoothies, and salads. I wanted to use the stems for juicing and knowing they had a strong bitter taste, decided to pair them with lemon, apple, squash, and celery. What came out was beautiful and tasty. It had some bitter tones, but it was a perfect blend for us. If the bitter frightens you just add more apple! Apple fixes everything! Well, almost. Michelle…it is funny that you post this about kale stems tonight of all nights. I had some kale that I wanted to use and decided what better way than to saute some onions, garlic, diced tomatoes, and kale. Well….oops….I left the stems on. You should have seen Dad and I trying to eat our vegies tonight. I believe I’ve learned my lesson. I shall continue to use the kale leaves-only for our smoothies as without a juicer they do need to find a spot elsewhere….I won’t mention where, as I do not have a compost bin here in Denver. I’m glad that you have a juicer and of course, that you are incredibly creative in devising ways to use those kale stems! Haha. Yes that is very coincidental! Well I hope you’ll try the saute again, without the stems. It sounds delicious!! Nice! I’m going to vote +1 on that idea. Though every pineapple I’ve seen in Portland seems twice as expensive as I remember. I love the apple/pineapple ideas, as I know bitters are good for me, but tend to shy away due to the…bitterness (duh). Have only dabbled in juicing (blend my nutrition drinks with fruit & veg on occasion) but now that we are in Portland I have endless fruit & veg options and no excuses not to eat fresh. 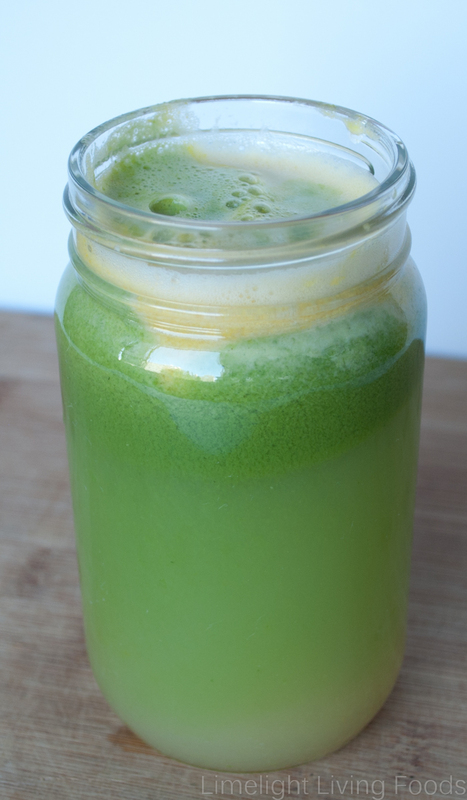 This concoction looks super nutritious and refreshing to me. Excited to learn more as I browse your site!